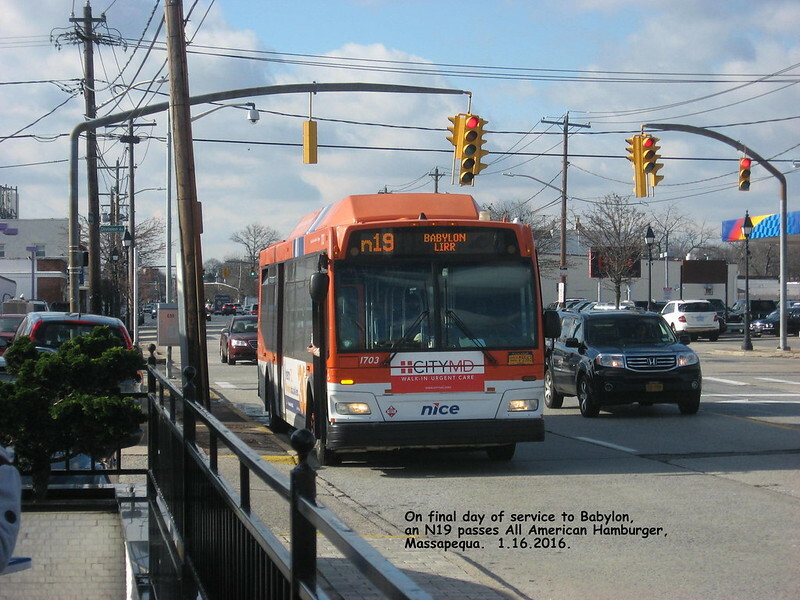 Service on N73 and N74 (Wantagh to Hicksville) will be discontinued 1.17.2016. 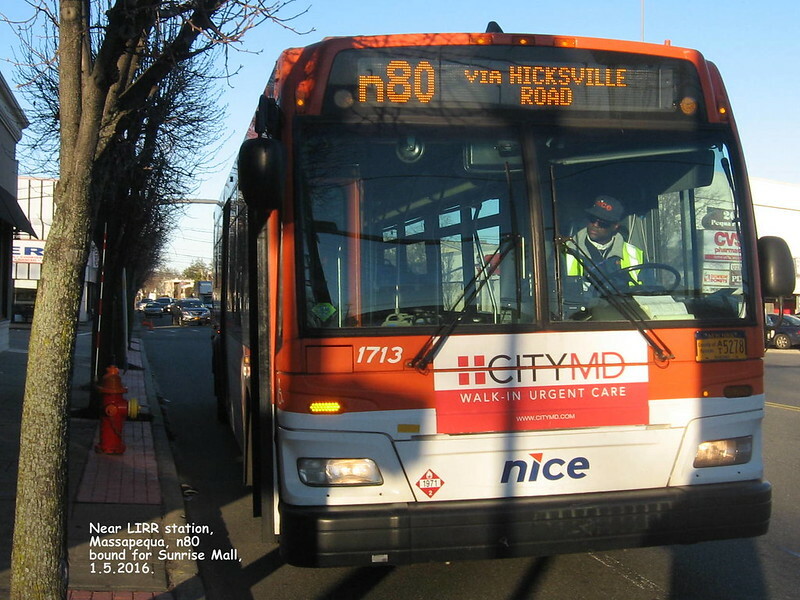 The Hicksville-Bellmore n50 will be eliminated on 1.17.2016. 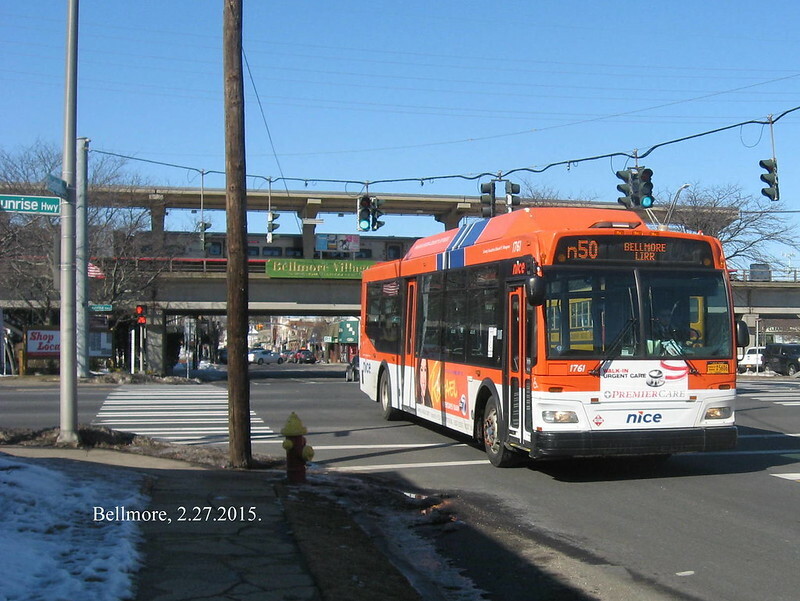 In this photo, it is seen southbound on Bedford Avenue. The Bellmore LIRR station is in the background. 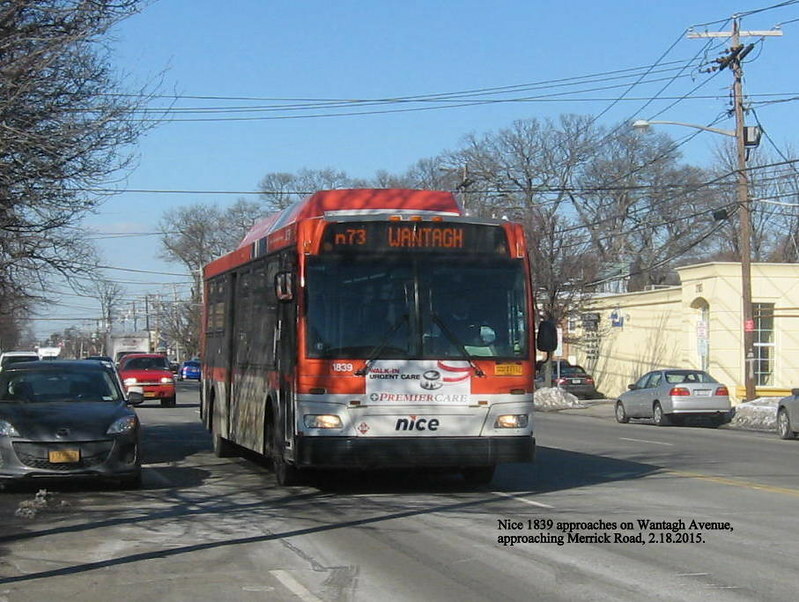 Both the n46 and n50 lay over here on Merrick Road before beginning their trips north. The routes will be eliminated 1.17.2016. The Spiga Bakery offers coffee, pastries, and tables all day, but no rest room. 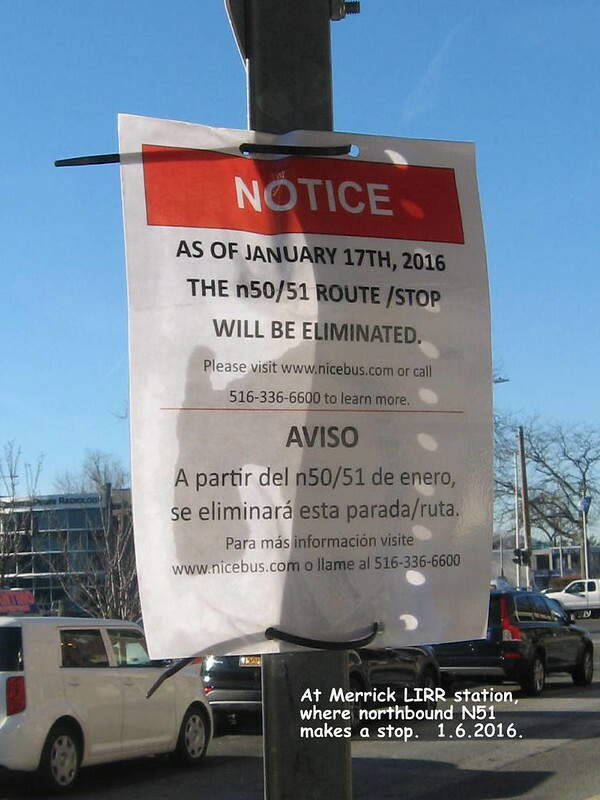 Merrick LIRR station is losing its only bus service, the N51 to Roosevelt Field. 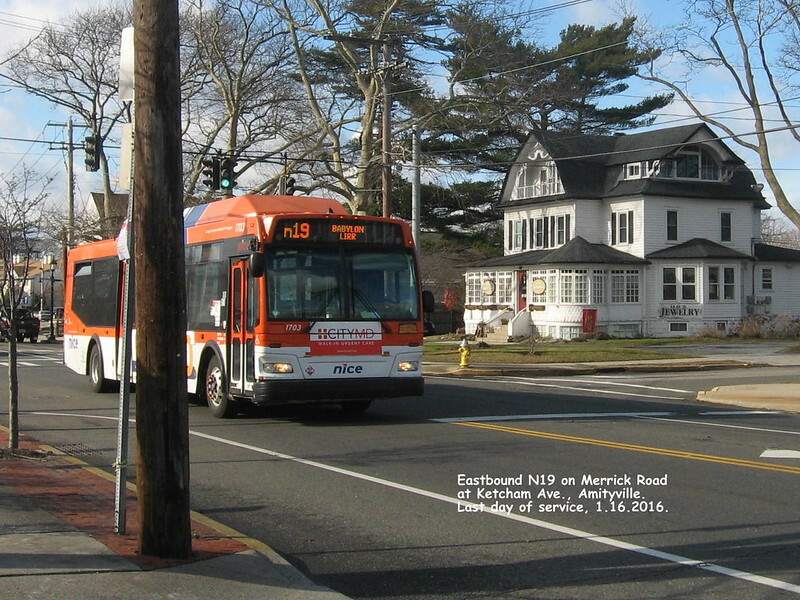 The southbound N51 uses Merrick Avenue all the way south to Merrick Road, where it turns east to loop north on Hewlett Avenue. 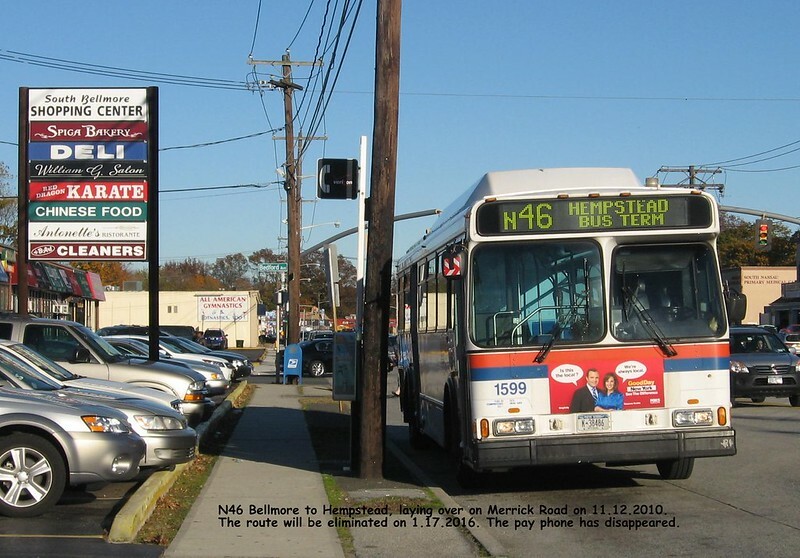 Merrick, an unincorporated part of the Town of Hempstead, has a median household income of about $132,000. 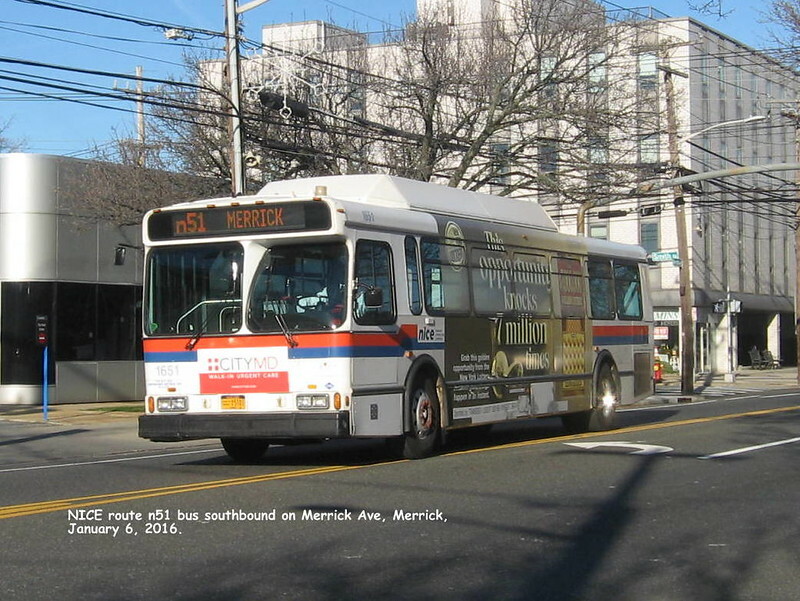 Attractive Merrick Avenue, a long north-south avenue, happens to carry heavy truck traffic between a garbage collection facility at 1600 Merrick Road and Covanta Energy at 600 Merchants Concourse, Westbury. 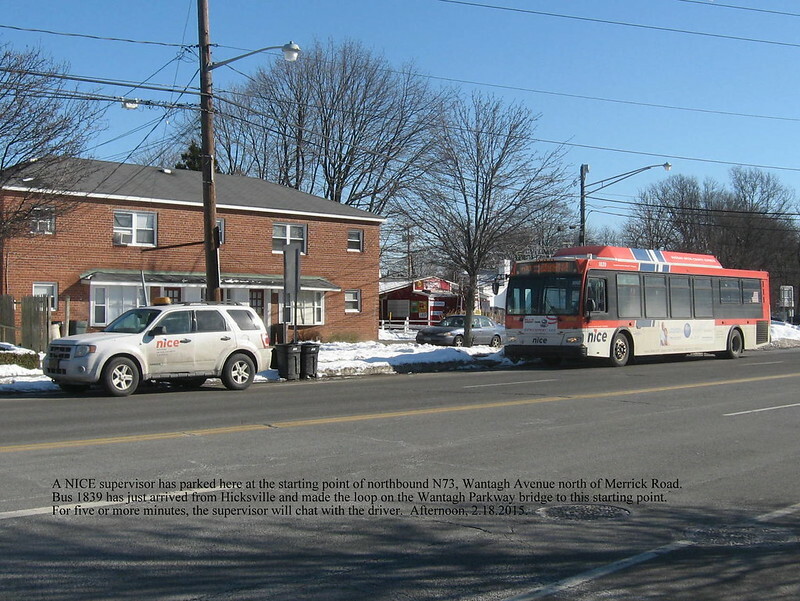 As of tomorrow, this portion of Merrick Road (Montauk Highway) in Suffolk County will be without bus service. In 1960, I rode Utility Bus Lines through here on its Freeport-Patchogue route. 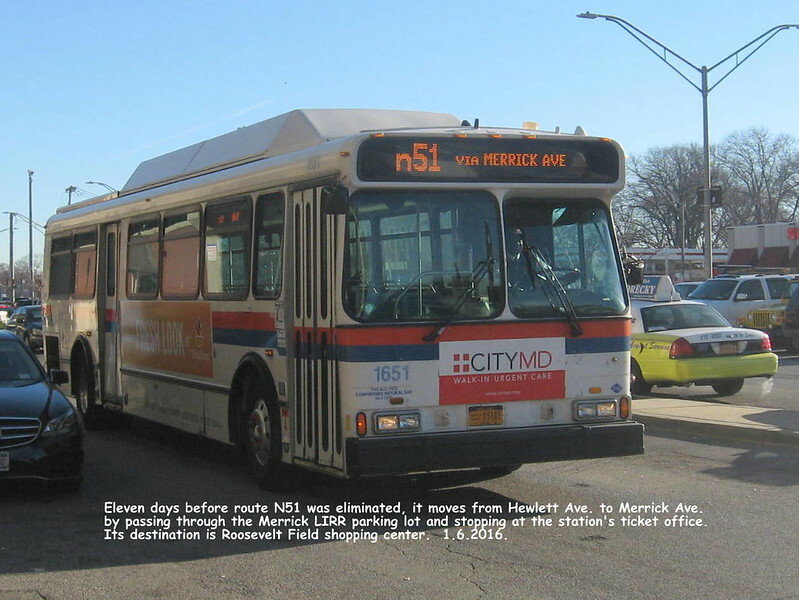 When the Metropolitan Suburban Bus Authority was created, Suffolk Transit took over the segment east of Babylon. Now, Nassau County has decided that the east terminus will be Sunrise Mall. 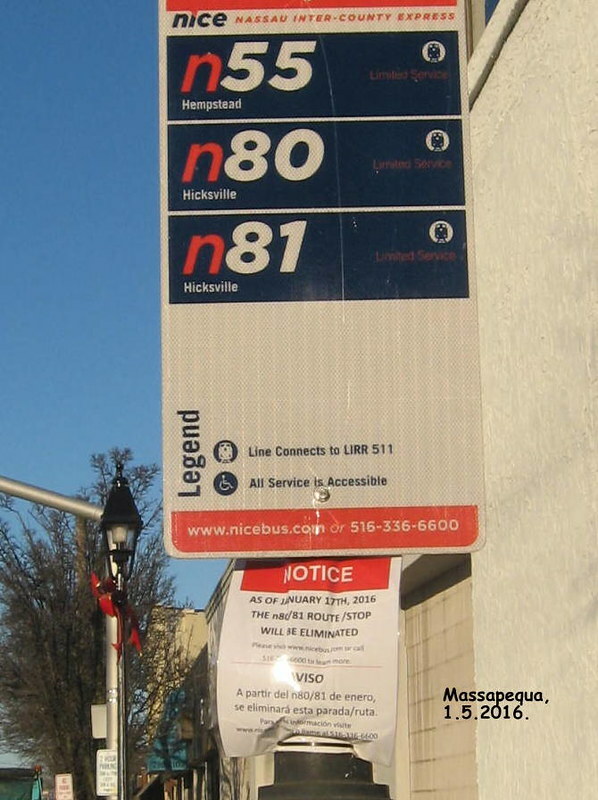 People in East Massapequa, Nassau County, will thereby also lose service. 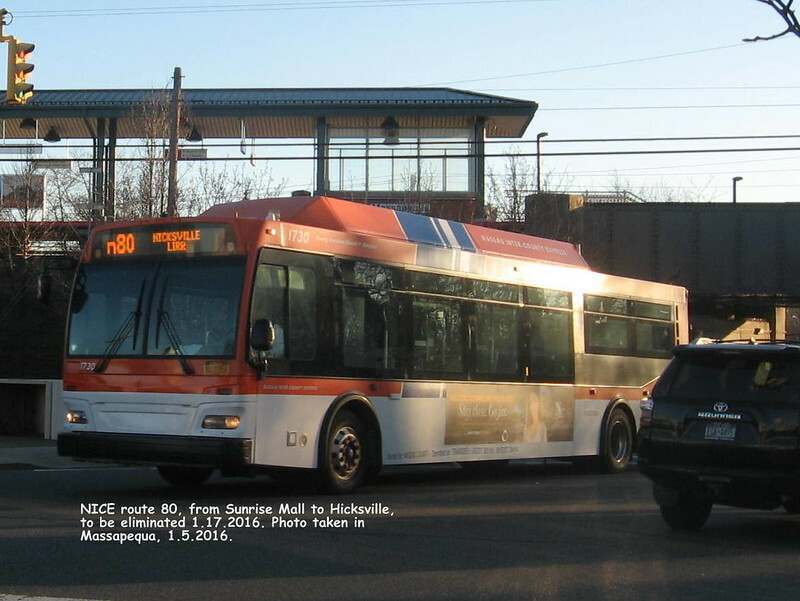 Not familiar with NICE...does it or the county determine routes and service? 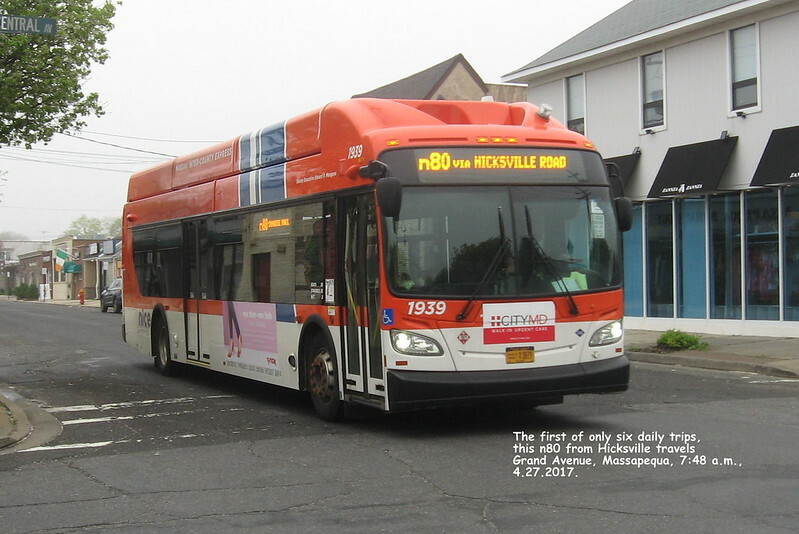 Answering Traildriver, I'm uncertain whether Nassau County or NICE determines which routes are eliminated, which saved. 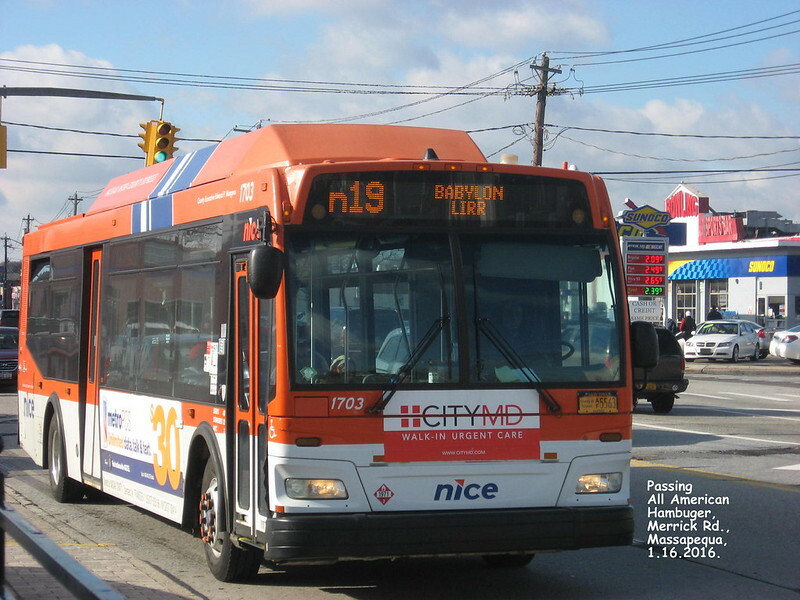 The n80, the only north-south route in eastern Nassau County, runs on a 90-minute headway, three trips in the morning, three in the evening, one bus, nine miles. As it passed me, I noted two passengers on the southbound. At the Massapequa LIRR station, four awaited the northbound trip.